Next year is a Ryder Cup year and the 2016 contest between teams from the United States and Europe will be played over the storied Hazeltine Golf Club in Chaska, Minn. Team Europe is on a roll having won eight of the last 10 Cups with the Americans in 2014 being defeated by a score of 16.5 for the Euros to 11.5 for the U.S.A. at Gleneagles in Scotland. Team U.S.A.’s most recent victory came in 2008 by the same score. 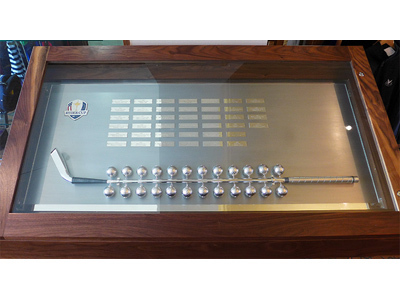 The Silver Putter was first presented to the PGA of America at the close of the 2010 Ryder Cup at Celtic Manor in Wales by Ryder Cup Europe, in a case with plaques engraved with the names of all the past match venues. At the 2012 matches, played at Medinah Country Club (Illinois) it was accompanied by 24 silver golf balls, one for each member of the two teams. Meant to be both a reminder and link to the past, present and future matches, it travels to the host site with a ceremony similar to that of the Olympic torch. Gleneagles has now presented the Silver Putter to Hazeltine, host venue next year, where it will be prominently displayed before being passed on to Le Golf National outside Paris, France, the 2018 site.